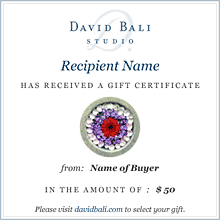 Fill in the receiver information whom you want to send the gift certificate. Value of gift certificate will be applied to the price of Item(s) selected by recipient plus shipping. For example, a gift certificate of $90 would purchase an item priced at $75 plus $15 shipping. Should the recipient chose and item costing more than the value of the gift certificate an email invoice will be sent for the option of paying the difference or selecting a lesser priced item. Should the recipient chose an item less than the value of the gift certificate including shipping a credit will be honored for the difference – no refund – and the recipient can chose another item and pay the difference.